There are people who think it's a waste of time to spend time customizing the colors in emacs. They are probably right; I haven't seen evidence that the some color scheme makes you more productive (which is the purpose of life, of course). Red on orange may not be the best though. 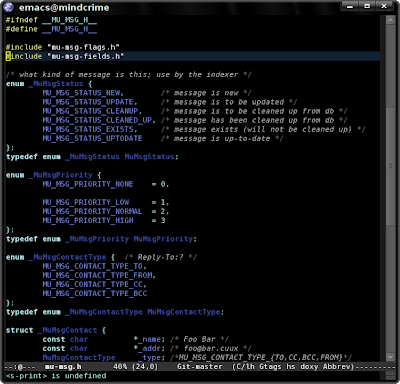 Nevertheless, I like to customize emacs' colors. I like darkness with shades of blue - please do your own psycho-analysis. You can also use set-face-foreground et al interactively; it lets you scroll to a long list of named colors, and alternatively you can use an HTML-style "#RRGGBB" hexadecimal red-green-blue color description. For example, "#000000" is black, "#ffffff" is white, and all colors of the form "#XYXYXY" (the RGB components are equal) give you various shades of gray: "#151515" is a rather dark gray, while "#e5e5e5" is rather light. For the full rainbow, a program like The Gimp can give you the hex-representation. Using this knowledge, we can define all the colors, make comments gray, warnings red and so on. However, some people have already done much of the work for you, and prepared a wide range of color themes -- get the color-theme-el package. After installing, you can select interesting color-themes like M-x color-theme-subtle-hacker or M-x color-theme-blippblopp. Meanwhile, color-theme-select gives you an overview of all available color theme. Of course, we're not happy with any of those, and prefer our very own theme. See below for an example of how to create your own color theme. When you're totally happy with the theme, you could even submit it to the color-theme people, and it might end up in a future version of the package. "dark color theme created by djcb, Jan. 2009." (show-paren-match-face ((t (:bold t :foreground "#ffffff"
To activate this theme, simply do M-x color-theme-djcb-dark. One nice side-effect of the color-theme package is the fact that colors work properly when you open new frames (windows). There is also the .Xdefault way to change emacs colors. But what I really want is a theme that works for both the terminal and normal GUI frames. @Pierre: yeah, that's a bit faster; I use Xdefaults for geometry, font and menu/toolbar on/off, which affect speed the most. in your .emacs. Good point about the console themes though; many themes that look nice in X are terrible in the console. To get a list of colors, M-x list-colors-display works for me. I get a nice list of 546 colors in a buffer to choose from. Are you familiar with Zenburn? It's a low contrast theme originally created for Vim but it spread like fire. For me personally it was a life saver, I had headaches every single day... hard not to if you're spending 16 hours a day in front of the screen. Pierre's elisp code works, but if you have a terminal emacsclient open at the same time you have an X-windows emacsclient open, you always get the same color theme in both frames. That is, do emacsclient -c -n to open an X-windows frame. You get a frame with the gnome2 color theme. Then do emacsclient -t. You get a terminal frame with the tty-dark theme. However... the X-windows theme jumps to the tty-dark theme also. I'm running emacs 23, using emacs --daemon to start the server. Is there any way around this? Now I know the downside of non-cumulativity: the standard are not used, so you have to set *every* face you use to a good value. Otherwise it's going to be 'default'. I was trying to use the above so as to not have my X-client theme interfere with the default theme. Problem with the above is that if I invoke emacsclient -c ; though the theme gets applied correctly (color-theme-comidia) it also applies it to any running non-x client sessions. Any way I can make sure it leaves the current terminal session theme alone and apply any themes mentioned above only for any X clients? Just needed to add the above line. The above bit worked perfectly for my situation. I recently discovered a page, where one can create a color-theme for emacs, vim, textmate ... there your can download an el-file, which uses color-them-mode to set the colors. After I've set up my colors the way I like them, how do I then save the color theme itself? That is, how do I export and save the color theme file, or at least get the color theme source into a buffer so I can then save it. @Anonymous: the easiest way might to take an existing color-theme (like zenburn, http://emacs-fu.blogspot.com/2010/04/zenburn-color-theme.html), change its name and make your changes. I think you should really update the post to rip out the Gimp line and mention the list-colors-display function. AFAIK it has been around for a long time and must be available to pretty much everyone. Of course it also gives you the hex representation. Anyway, I landed here while searching for the name of the face (color?) used for the window separators, still searching. Zenburn advisor, you got my heart. I can have same screen for both vim and emacs. Zuppa! http://emacswiki.org/emacs/ColorTheme#toc4 for info about WYSIWYG cycling among themes.